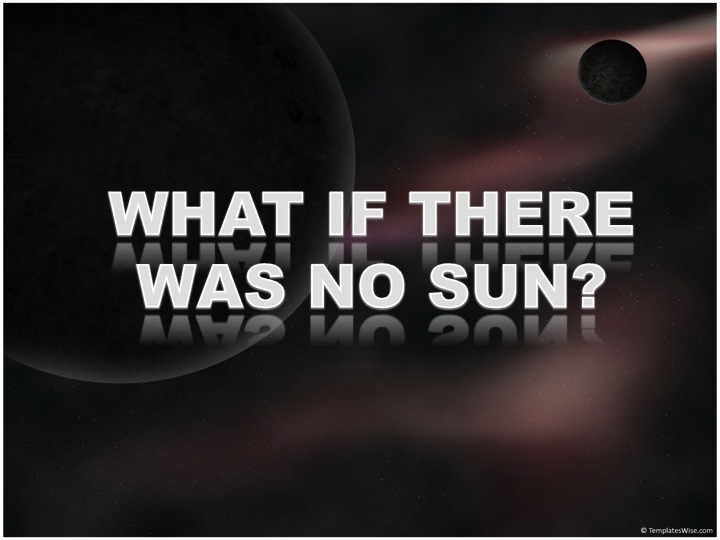 Thought for the week: What if there was no sun? If there was no sun, there would be nothing there wouldn’t even be anything! Nothing will exist. Sun is the main & ultimate source of energy for all living things. No sun, no living things. As, all living things will eventually die as no energy is for them. Plants need sunlight to make food.No sunlight, no plants making food, so they die. It also means, plants no longer exists. If there’s no plants, no herbivores. the sun is a huge part of the galaxy and one of the solar system’s most significant tools too, if the sun just dissapeared mammals,reptiles ,fishes and humans or any living thing for that matter that relies on the energy from the sun to make food for them life on earth would have ceased to exist by now.Why would you ask such a question Ms Papas?. Nyeemah says people wouldn’t be able to see. If there wasn’t any sun that would mean the whole city would be dark. Breanna. If there was no sun it would be night-time and it would be cold when people wake up. Daneika. If there is no sun, there would be no life. That’s because all the energy we get is directly or indirectly from the solar energy.Sun provides heat and light necessary for all our life processes and metabolic activities.Plants prepare food through photosynthesis which requires sunlight.Further we all get energy from that food which plants prepared using sunlight.So simply,sun is the ultimate source of energy in the universe and without it, we cannot live at all! If there was no sun,everybody will be cold and everybody will be moaning and groaning because there will be no heat or light. If there was no sun, the plants won’t grow and people won’t see where they are. They would be lost. There will be no trees plants or fruit because it needs the sun to help it grow, also everywhere in the world will be dark and people, will bump into things and if they bump into sharp things they probaly will die. It will mean we will be dead be now and it will be easter everyday and there will not be any light in the world. If there was no sun the earth would be cold and dark. Everyone would die and freeze to death. Life would not exist on the planets. If there was no sun then if you go on holiday then you won’t get a sun burn. I thing that if there is no sun it would be dark all the time and no one can see were they are going. If there was no sun the whole universce would be dark. If there was no sun everyone would freeze to … DEATH EVERY SECOND!!!!!! If there was no sun then plants wouldn’t be able to grow. The sun also is a source of light and heat. If there was no light we won’t be able to see and injure ourselves. Also, if there was no heat we would freeze up and eventually die away. If there was no sun you would not be able to breathe because the sun carries a lot of oxygen.